Dimitar Berbatov celebrated his 32nd birthday with a vital - if offside - goal that spurred Fulham onto victory against London rivals West Ham. After a bright start to the season, the Cottagers' form has tailed off dramatically and manager Martin Jol admitted in the build-up this clash was "vital" to his struggling side. That sense of importance was evident from the outset as Fulham came out swinging, with Berbatov nodding home the opener just 10 minutes in. Replays showed the Bulgarian was in an offside position when Damien Duff sent in the free-kick, but the home side were not complaining after a run of just two league wins in 15. West Ham have endured similar struggles of late but showed impressive fight by the Thames, levelling things up through captain Kevin Nolan in the 48th minute. Hugo Rodallega bundled home a Duff cross just a minute later to put Fulham on course for their second league win of 2013, which was secured in stoppage time when Joey O'Brien inadvertently put into his own goal. After seeing Joe Cole shoot wide after 19 seconds, Fulham forced the east Londoners onto the back foot during a bright opening. Guy Demel did well to stop Duff latching onto a looped through ball from Berbatov, before Winston Reid denied the latter after neat link-up play. 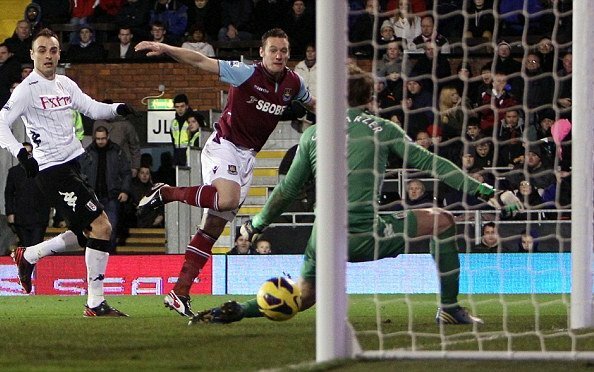 Jussi Jaaskelainen was forced into action in the eighth minute, parrying away a fierce Bryan Ruiz effort from 20 yards. Duff fired across the face of goal moments as Fulham pressed for an opener that came in the 10th minute. Duff sent across a free-kick from the right, which looked to take the slightest of touches off Ruiz as it made its way to Berbatov to head home. It was a moment of luck for the hosts as the Bulgarian was offside when the ball was whipped in - something the forward seemed aware of given he looked at the linesman before celebrating. The goal jolted West Ham into life and they soon began to threaten from the flanks. Matt Jarvis should have done better when meeting a Demel cross from six yards and, after Duff struck another shot across Jaaskelainen's goal, Nolan nodded a Mohamed Diame ball wide when well placed. Diame's next action was an altercation with Steve Sidwell following a strong challenge, leading to heads meeting, words being exchanged and the Fulham midfielder collecting a booking. Fulham dominated the rest of the first half after that. Reid blocked a well-struck Giorgos Karagounis effort and a Ruiz ball just evaded Rodallega. Berbatov came closest, wriggling free just inside the Fulham half and bursting past several West Ham players, before firing just wide of the near post. Sam Allardyce clearly had strong words with his with side at the break given the way they flew out the blocks. The Hammers pressed from the restart and grabbed an equaliser in the 48th minute. Mark Noble played a quick free-kick that caught the hosts off guard and Nolan did well to fire a low left-footed strike from an acute angle past Mark Schwarzer. The stalemate lasted for just a minute, though. Duff burst down the left flank and sent in a cross that Rodallega reached ahead of West Ham's defenders to bundle home. It was an electric start to a second half that soon settled, with Carlton Cole replacing Marouane Chamakh as the Hammers searched for another leveller. Nolan saw a tame effort denied by Schwarzer, who again thwarted the West Ham captain with a fantastic one-handed save in the 70th minute. Berbatov soon lashed inches wide as play swung from end to end, with Joe Cole claiming a penalty against Brede Hangeland. Andy Carroll soon replaced his former Liverpool team-mate and forced Schwarzer into action moments into his first appearance since November 28. Mladen Petric and Rodallega both fluffed chances for Fulham in the closing stages, which Philippe Senderos spent hobbling after collecting a knock. Fulham wrapped up victory in stoppage time as Jaaskelainen parried a shot into Petric's path and his dinked effort was directed home off O'Brien.